Download "Personal Service Companies and IR35"
1 Personal Service Companies and IR35 Introduction The IR35 rules are intended to prevent the avoidance of tax and National Insurance Contributions (NICs) through the use of personal service companies and partnerships. The rules only affect you if you: Work for someone else or provide your services to clients; and You would be considered to be their employee (in law) but for the existence of your limited company or partnership. Thus this could affect you if you provide your services through a company and have one or two customers for whom you effectively work full-time. On the other hand, if you provide your services to many customers you are far less likely to be affected. The rules do not stop you supplying your services through your own company or a partnership. However, they do seek to remove any possible tax advantages from doing so. The IR35 shorthand reference to these rules dates back to when they were first introduced by the 35 th IR press release of the Chancellor s Budget in Removal of tax advantages The tax advantages mainly arise by extracting the net taxable profits of the company by way of dividend. This avoids any NICs which would generally have been due if that profit had been extracted by way of remuneration or bonus. The intention of the rules is to tax most of the income of the company as if it were salary of the person doing the work. 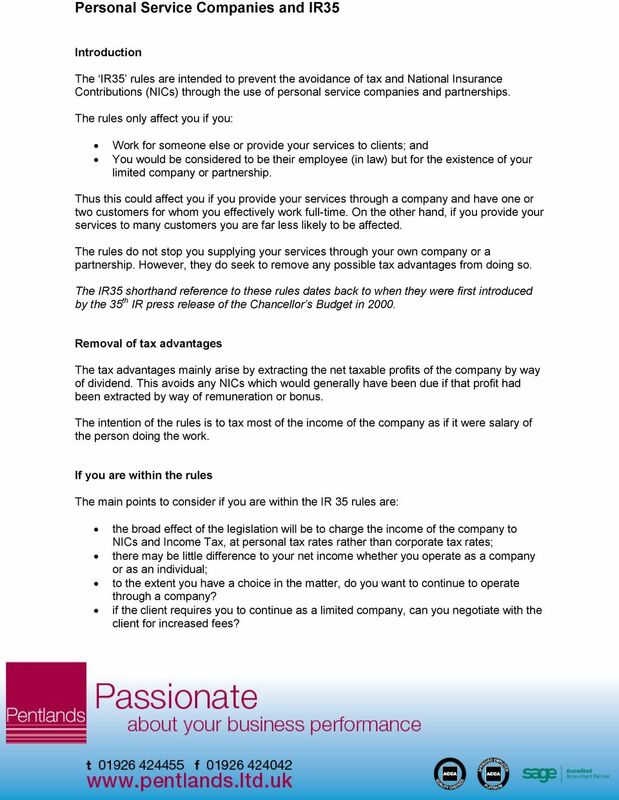 If you are within the rules The main points to consider if you are within the IR 35 rules are: the broad effect of the legislation will be to charge the income of the company to NICs and Income Tax, at personal tax rates rather than corporate tax rates; there may be little difference to your net income whether you operate as a company or as an individual; to the extent you have a choice in the matter, do you want to continue to operate through a company? if the client requires you to continue as a limited company, can you negotiate with the client for increased fees? 2 if you continue as a limited company you need to look at the future company income and expenses to ensure that you will not suffer more taxation than you need to. The last point is considered in more detail below. Employment v self-employment The question as to whether you would be an employee or not (but for the use of your company) is fundamental to the IR35 rules. The taxman will want to know how the relationship operates between you and your client regardless of the terms of any agreements or contracts. These will also be important but they cannot change the facts. This is because the dividing line between employment and self-employment has always been a fine one. All relevant factors will be considered, but overall it is the intention and reality of the relationship that matters. The table below sets out the factors which are relevant to the decision. HMRC will consider the following to decide whether a contract is caught under the rules Mutuality of obligation Control Equipment Substitution Financial risk Basis of payment the customer will offer work and the worker accepts it as an ongoing understanding? the customer has control over tasks undertaken/hours worked etc? the customer provides all of the necessary equipment? the individual can do the job himself or send a substitute? the company (or partnership) bears financial risk? the company (or partnership) is paid a fixed sum for a particular job? Benefits the individual is entitled to sick pay, holiday pay, expenses etc? Intention the customer and the worker have agreed there is no intention of an employment relationship? Personal factors the individual works for a number of different customers and the company (or partnership) obtains new work in a business-like way? 3 HMRC have published guidance designed to help contractors self-assess their possible liability to the IR35 rules. The IR35 Forum has recently reviewed the new approach to administering IR35 introduced in This review included the Business Entity Tests (BETs) that businesses can take to self-assess their risk of IR35. HMRC s review found that the tests were not been widely used and are not fulfilling their intended purpose. The BETs have been withdrawn with effect from 6 April HMRC will not re-visit a closed enquiry based on a result of the BETs within the 3 year period previously notified to the business. Updated guidance for IR35 is expected to be published shortly. Exceptions to the rules If your company has employees who own 5% or less of the shares, the rules will not be applied to the income that those employees generate for the company. Note however that in establishing whether the 5% test is met, any shares held by associates must be included. How the rules operate The company operates PAYE & NICs on actual payments of salary to the individual during the year in the normal way. If, at the end of the tax year - ie 5 April, the individual s salary from the company, including benefits in kind, amounts to less than the company s income from all of the contracts to which the rules apply, then the difference (net of allowable expenses) is deemed to have been paid to the individual as salary on 5 April and PAYE/NICs are due. Allowable expenses normal employment expenses (e.g. travel) certain capital allowances employer pension contributions employer s NICs - both actually paid and due on any deemed salary 5% of the gross income to cover all other expenses. 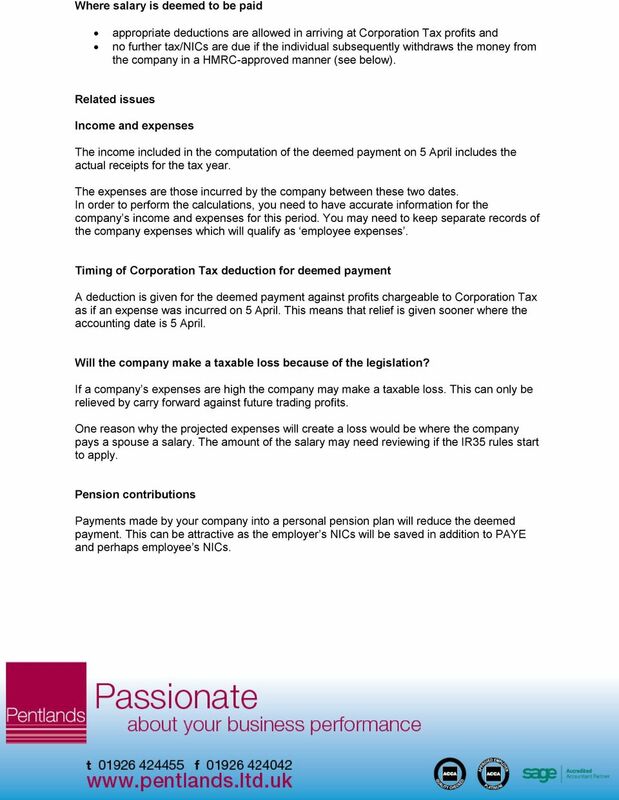 4 Where salary is deemed to be paid appropriate deductions are allowed in arriving at Corporation Tax profits and no further tax/nics are due if the individual subsequently withdraws the money from the company in a HMRC-approved manner (see below). Related issues Income and expenses The income included in the computation of the deemed payment on 5 April includes the actual receipts for the tax year. The expenses are those incurred by the company between these two dates. In order to perform the calculations, you need to have accurate information for the company s income and expenses for this period. You may need to keep separate records of the company expenses which will qualify as employee expenses. Timing of Corporation Tax deduction for deemed payment A deduction is given for the deemed payment against profits chargeable to Corporation Tax as if an expense was incurred on 5 April. This means that relief is given sooner where the accounting date is 5 April. Will the company make a taxable loss because of the legislation? If a company s expenses are high the company may make a taxable loss. This can only be relieved by carry forward against future trading profits. One reason why the projected expenses will create a loss would be where the company pays a spouse a salary. The amount of the salary may need reviewing if the IR35 rules start to apply. Pension contributions Payments made by your company into a personal pension plan will reduce the deemed payment. This can be attractive as the employer s NICs will be saved in addition to PAYE and perhaps employee s NICs. 5 Extracting funds from the company For income earned from contracts which are likely to be caught by the rules, the choices available to extract funds for living expenses include: paying a salary borrowing from the company and repaying the loan out of salary as 5 April approaches paying interim dividends. The advantage of paying a salary is that the tax payments are spread throughout the year and not left as a large lump sum to pay on 19 April. The disadvantage is fairly obvious! Borrowing from the company on a temporary basis may mean that no tax is paid when the loan is taken out, but it will result in tax and NICs on the notional interest on the loan. There may also be a need to make a payment to HMRC equal to 25% of the loan under the loans to participators rules. The payment of dividends may be the most attractive route. If a deemed payment is treated as made in a tax year, but the company has already paid the same amount to you or another shareholder during the year as a dividend, you will be allowed to make a claim for the tax on the dividend to be relieved to avoid double taxation. The company must submit a claim identifying the dividends which are to be relieved. Year-end planning There is a tight deadline for the calculation of the deemed payment and paying HMRC. 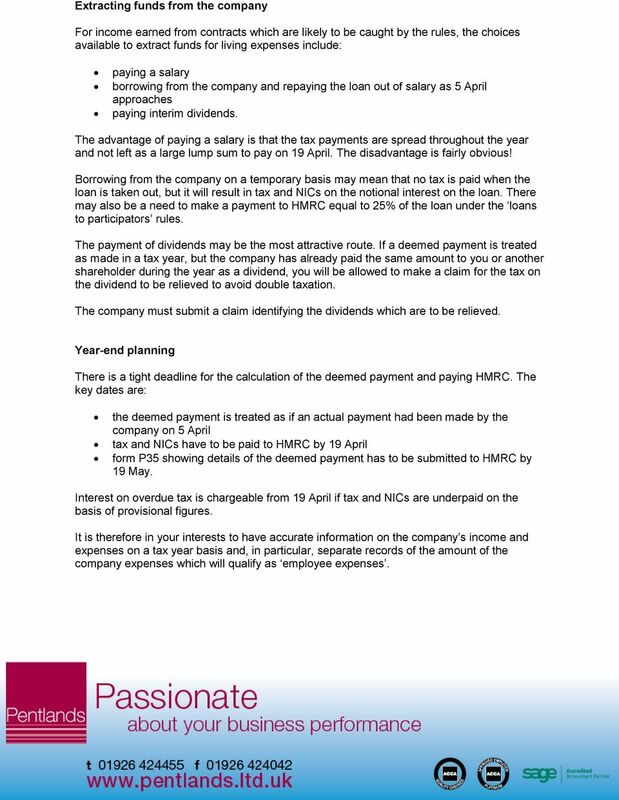 The key dates are: the deemed payment is treated as if an actual payment had been made by the company on 5 April tax and NICs have to be paid to HMRC by 19 April form P35 showing details of the deemed payment has to be submitted to HMRC by 19 May. Interest on overdue tax is chargeable from 19 April if tax and NICs are underpaid on the basis of provisional figures. It is therefore in your interests to have accurate information on the company s income and expenses on a tax year basis and, in particular, separate records of the amount of the company expenses which will qualify as employee expenses. 6 Partnerships General rule Where individuals supply their services through a partnership, the rules are applied to any income arising which would have been taxed as employment income if the partnership had not existed. In other words, where a partnership receives payment under an employment contract : income of the partnership from all such contracts in the year (net of allowable expenses as described above) are deemed to have been paid to the individuals on 5 April as salary from a deemed employment with PAYE/ NICs due accordingly and any amount taxed in this way as if it were employment income is not then taxed as part of the partnership profits. Partnerships excluded from the rules Many partnerships are not caught by the rules even if one or more of the partners performs work for a client, which may have the qualities of an employment contract. The rules only apply to partnerships where: an individual, (either alone or with one or more relatives), is entitled to 60% or more of the profits or all or most of the partnership s income comes from employment contracts with a single customer or any of the partners profit share is based on the amount of income from employment contracts. Penalties Where a company or partnership fails to deduct and account for PAYE/NICs due under the rules, the normal penalty provisions apply. If the company or partnership fails to pay, it will be possible for the tax and NICs due to be collected from the individual as happens in certain circumstances under existing PAYE and NIC legislation. 7 Managed Service Companies (MSCs) MSCs were a widespread attempt to avoid the IR35 rules. Some were known as composite companies or managed PSCs. In 2007 the government introduced legislation which applies to MSCs. 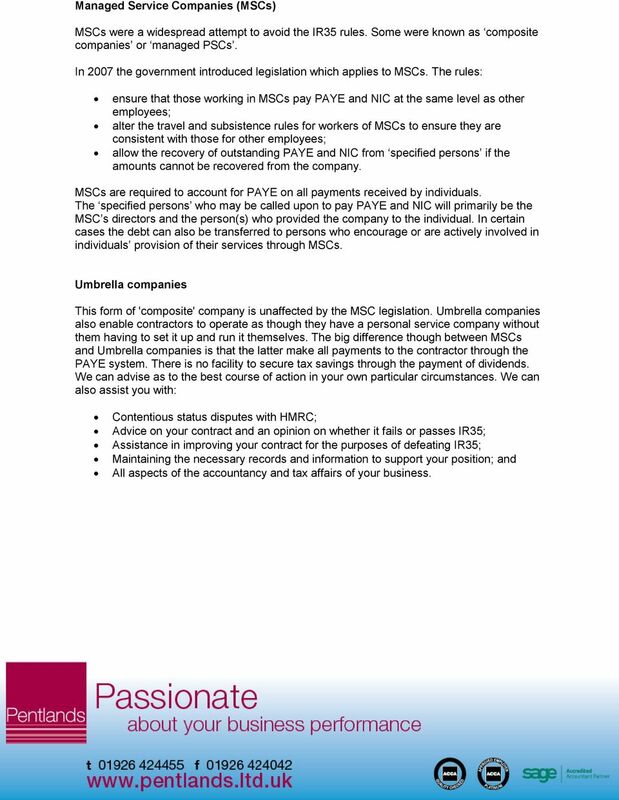 The rules: ensure that those working in MSCs pay PAYE and NIC at the same level as other employees; alter the travel and subsistence rules for workers of MSCs to ensure they are consistent with those for other employees; allow the recovery of outstanding PAYE and NIC from specified persons if the amounts cannot be recovered from the company. MSCs are required to account for PAYE on all payments received by individuals. The specified persons who may be called upon to pay PAYE and NIC will primarily be the MSC s directors and the person(s) who provided the company to the individual. In certain cases the debt can also be transferred to persons who encourage or are actively involved in individuals provision of their services through MSCs. Umbrella companies This form of 'composite' company is unaffected by the MSC legislation. Umbrella companies also enable contractors to operate as though they have a personal service company without them having to set it up and run it themselves. The big difference though between MSCs and Umbrella companies is that the latter make all payments to the contractor through the PAYE system. There is no facility to secure tax savings through the payment of dividends. We can advise as to the best course of action in your own particular circumstances. We can also assist you with: Contentious status disputes with HMRC; Advice on your contract and an opinion on whether it fails or passes IR35; Assistance in improving your contract for the purposes of defeating IR35; Maintaining the necessary records and information to support your position; and All aspects of the accountancy and tax affairs of your business.